Previously we mentioned about the Lippert’s Core Express smallest form factor size Intel Atom based platform but it seems to be a bit unfair to said that since only the main core is built on the board while leaving other necessary peripheral ports resided on bigger size baseboard. 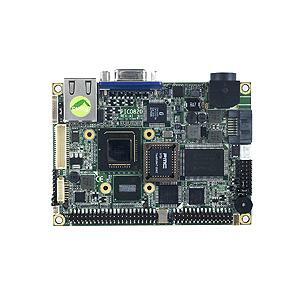 Now with the announcement of the pico-ITX Intel Atom based SBC (Single board computer) by Axiomtek, it appears to be the first smallest Intel Atom standalone motherboard that can be used independently for embedded applications. Named as PICO820, it is powered by Z-series Intel Atom processor pairing with US15W SCH chipset with both built onto 10cm X 7.2cm pico-ITX form factor. Pico-ITX is smaller than both Mini-ITX and Nano-ITX and has been widely deployed by VIA Technologies to build its famous VIA’s processors. With the Intel Atom ultra small foot print of only 13mm X 14mm and relatively large US15W SCH chipset, there are still some space available for Axiomtek to integrate some basic interfaces such as Gigabit Ethernet port, SATA interface, USB ports, SDIO as well as legacy serial and PS/2 for various market segments. Besides, there is an additional LVDS connector for users to plug with external LCD display with resolution support of up to 2048 X 1536 non standard resolutions. That is not all, it also features with SO-DIMM DDR2 of up to 1GB maximum memory and Compact Flash slot for boot up or external memory support. PICO820 will be available in fourth quarter and is compatible with different flavors of OS (Operating support) such as Linux, Windows XP, XP Embedded and Windows CE. No availability about the pricing, but this is another breaking news for Intel Atom since it is the first smallest standalone platform available for embedded world.